Bio: Quick-strike attack drone who can take a pounding and keep flying. Although I wasn't a massive Action Force (or G.I. 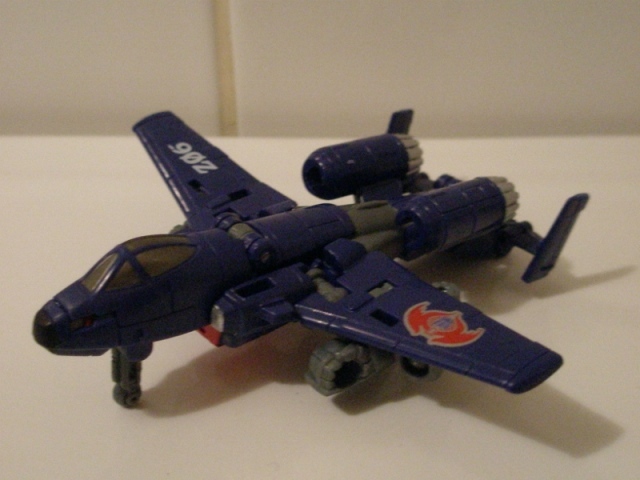 Joe if you're from across the pond) fan, I always liked the Cobra Rattler I got one Christmas. It was huge, for one thing, and I loved the old-fashioned look of the thing. And the pilot Wild Weasel was cool as. So when I saw this little Legends guy done up in homage to the Rattler, I was sold. Viper's been crowbarred into the melee of Combiner Wars, one of a number new characters slipped into the Generations update-the-old-guys fanservice line. 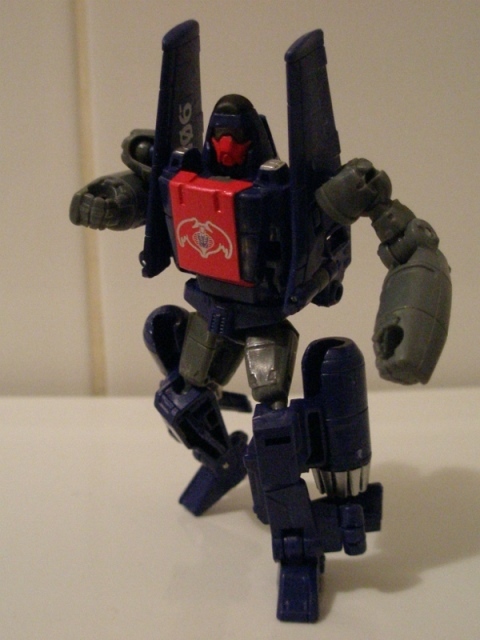 He first popped up in some video game thing I wont pretend to know anything about and is a retool/ redeco of Powerglide, who came out a few months earlier in this line. I've always liked the smaller Transformers figures. When they're done well, they can rival some of the best of the larger toys and after the generally excellent Combiner Wars Bombshell toy, I was hopeful that Viper would similarly be awesome. Robot Mode: Very obviously an evil version of Powerglide, the figure on first impression doesn't do much to put much of a stamp of individuality on Powerglide's frame. Proportionally, he's pretty good, all straight lines with only the Popeye-like forearms making it obvious that this is a minor tweaking of a mould clearly designed with another character in mind. There's some good detailing on show too, with various panel lines and etched panels which I like. The headsculpt is decent, but its not particularly pretty. Its there to mimic Wild Weasel's helmet, but it doesn't quite come off. Instead, he looks like he's got an enormous nose for a face. It also makes his face look very fat too, which doesn't fit with his athletic looking body. The palette is pretty plain too, which is fine – works well for realism- save for the big blob of red that is his chest. Honestly, this looks awful. It dominates too much over the rest of his body. I'd have much preferred that Hasbro left the whole body that lovely navy blue and just had that wicked Cobra/ Decepticon tampograph decorating the chest. He looks like he's wearing a tabard. Or a bib. Alternate Mode: A pretty swish looking A10 Thunderbolt II, Viper makes a good fist of the real thing with some nice design work and a homage to the aforementioned Cobra Rattler by sporting Z06” on the right wing. Only the slightly floppy rear tail fins let down what is otherwise a very nice alt mode which is great for swooshing about. 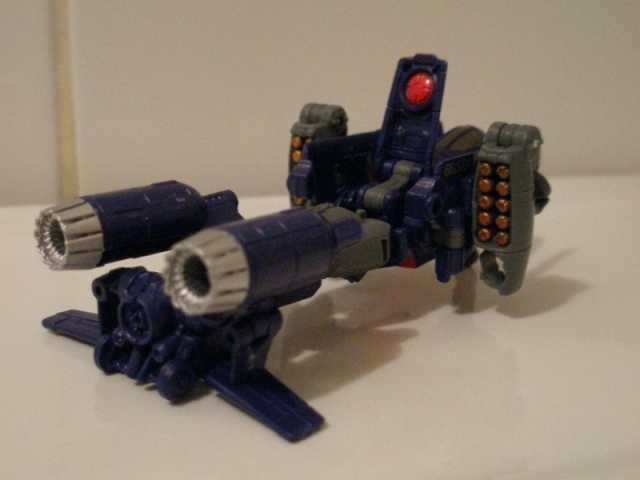 Alternate Mode: The weapon mode is what it is. It looks like a crumpled up aeroplane crossed with a coat hanger. It looks alright and is passable enough. It lacks a little bit of structural integrity where the robot legs come together to form the barrel of the thing. It may be my example, but the hips are a little loose so this thing tends to list a little. 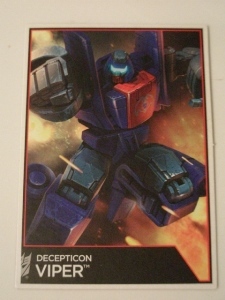 Its not a big deal, and I like it as a fun play feature for the larger robots to wave this thing around.